Today we begin the novena to St. Dominic Savio, whose feast day is on March 9. He is the patron saint of boys, children’s choirs, falsely accused people, and juvenile delinquents. Dominic, one of 10 children of a blacksmith and a seamstress, was born in 1842 in Riva di Chieri, Italy. He became an altar server at age five, and began preparing for the priesthood as a twelve year old under the direction of Father John Bosco (the future St. John Bosco), for his new Salesian order of priests. In 1857, fifteen-year-old Dominic contracted tuberculosis and was sent home to recover. He died shortly after his return. 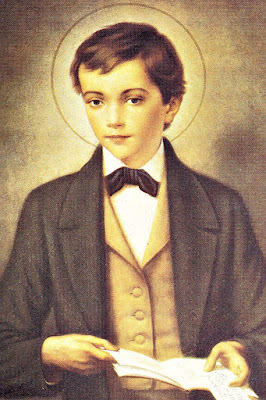 Dear Saint Dominic Savio, you grew under the supervision and care of St. John Bosco. Witnessing the zeal of your mentor you shared his desire to bring the Lord a great many souls. Despite your frail and weak constitution you devoutly waited for Holy Mass kneeling outside your church until the doors opened despite rain or snow. We ask you to look upon all young people and inspire them to love the Holy Eucharist as you did. Pray that we may all share your aversion for sin and achieve a life of sanctity. Jesus always spoke of his love for children and we know that your requests will be well received. We humbly ask that you bring our petitions before the Lord.